After teaching yoga for several years in Magnolia, Lee wanted to provide a peaceful sanctuary close to home for students to practice, so she opened the studio in 2001. Yoga and spending time in nature have been threads of peace and centering throughout Lee’s life from the time she was a child. Her classes, workshops, and international retreats reflect her unbounded love of the natural world and focus on getting in touch with our interconnectedness with all things. Lee teaches with warmth, patience and compassion. 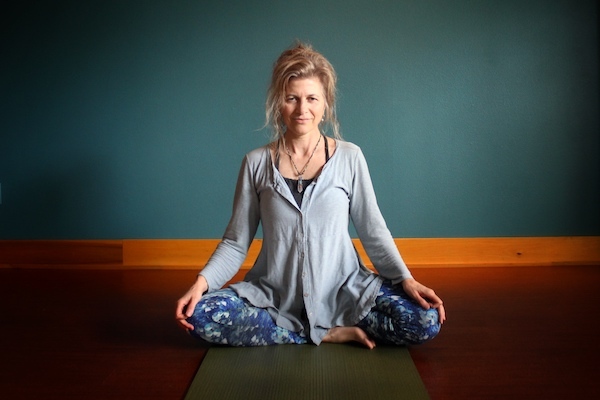 She loves to weave poetry, and yogic philosophy throughout her classes. Her vinyasa style of teaching is flowing and meditative while paying attention to the dance of the breath and alignment and form of the body enabling her students to uncover and discover increased health, wellbeing, and peace within themselves. Her classes reflect her philosophy that yoga is not about self-improvement, but yoga is about self –acceptance and discovering our true Self. Over the years she has been inspired by numerous teachers including Rodney Yee and Leslie Young, but lately her inspiration for her asana classes comes from her heart and her students who inspire her on a daily basis. Learning and practicing meditation and yoga from an early age, she now receives guidance from her guru Baba Hari Dass from the Raja Yoga tradition. Lee has thorough anatomy and physiology training that she received from The West Coast College of Massage in Vancouver Canada in 1995 / 96. Her massage practice is based on the principles of Ayurveda – that we feel most vibrant when all aspects of who we are – body, mind, spirit are in a place of balance – and that we can facilitate wellness by balancing the elements of earth, air, fire, water and ether within us. Her philosophy in regards to body work is that the harmony of health can be nurtured and nourished through the use of healing touch, sound resonance, and the infinite energy of light and love.